We are a proud AKC Breeder located in Central Oklahoma. We specialize in European , DEUTSCH KURZHAAR, Black GSP's however we have dogs of all colors and can throw any color combination depending on the breeding pair. We breed for high quality hunters and working companions. We strive to produce top quality German Shorthaired Pointers that are exceptional in the field, at show as well as in the home with family and friends. 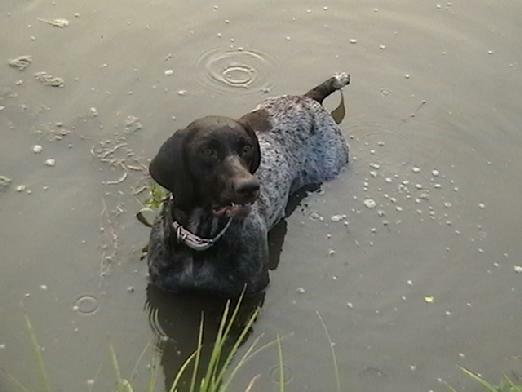 If you are looking for a bird dog or water dog, then check out our tremendous German Shorthaired Pointers, they live to hunt, love the water and are eager to please. Our hunting dogs are fearless! They have tremendous drive, intelligence and style. Our GSP's have AKC, International, and NSTRA Champions in their bloodlines, far too many to list here! Check out our GSP pages for more details, pedigrees, pics and information. Here at POWER POINTERS.INFO we believe that we have the perfect pointer for everyone. If your an animal lover at heart, then we have the perfect addition to your family waiting for you.